Please join Whitworth University for the ninth annual Leonard A. Oakland Film Festival, Feb. 9-12. This year’s 7 p.m. showings will feature documentarian Alexandra Hidalgo, a Whitworth faculty panel, and a World War II international film. Hidalgo will host a lecture on film and video production, film studies, gender, race, immigration, and her own experience in the industry on Thursday, Feb. 9, at 7 p.m., in Weyerhaeuser Hall’s Robinson Teaching Theatre at Whitworth University. On Friday, Feb. 10, at 7 p.m. in the same location, a Q&A with Hidalgo and a showing of her most recent feature documentary, Vanishing Borders, will be held. Vanishing Borders follows the story of four immigrant women who live in New York City and who are transforming their communities through their work, activism, and the way their cultural hybridity influences their interactions with others. This event is free and open to the public. For the complete festival schedule, please visit www.whitworth.edu/oaklandfestival. For more information about Whitworth’s annual film festival, please visit this site: Leonard Oakland Film Festival. Hidalgo is an assistant professor of writing, rhetoric, and American cultures at Michigan State University, where she teaches professional writing, film and video production, rhetoric, and composition courses. She was born in Caracas, Venezuela, and she immigrated to Dayton, Ohio, in high school; many of her projects delve into questions of identity through gender, race, and pop culture. 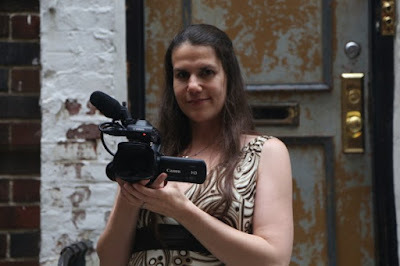 Her documentary work and online projects find ways to make academic ideas accessible to everyone, including those outside scholarly communities. She is fascinated with the ways in which film and video can be used within academia to enrich scholarly inquiries and encourage others to interact with publics outside university settings. For more information, please visit her site, www.alexandrahidalgo.com. Kelsey Bumgarner, assistant director, donor relations, Whitworth University (509) 777-4605 or kbumgarner@whitworth.edu.